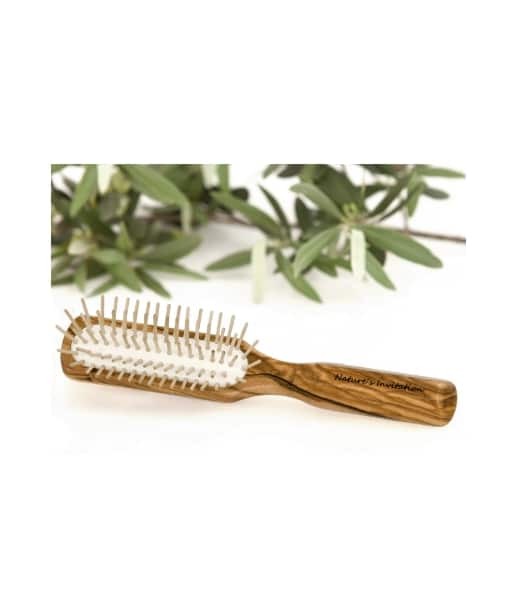 Beautiful small capillary brush made of pure olive wood, ideal model to carry in your suitcase. making it a quality product and high strength. Its rounded pins gently massage the scalp. inspire the creation of unique objects. This tree is used only for the manufacture of wood as it approaches the end of its life and ceases its production. This beautiful brush is a natural product that untangles the hair without forming static electricity or damaging the hair strand . Static electricity from the hair can weaken the wires and cause sagging, and in contact with a plastic brush, it can screw until it breaks. When hair is charged with static energy attracts particles of air pollution, which hampers free sweating and evaporation of the natural fluids from the wires. When the wires are electrically neutral they are easily freed from the polluting particles and the capillary breathing becomes freer. The FSC label is granted to wooden products that come from responsibly managed forests or plantations – certified in accordance with the strict guidelines of the Forest Stewardship Council. Clean all hair strands from your brush as well as scaly scaly residue (dandruff vulgaris) with a special cleaning brush. Wash the brush with warm water and a little organic shampoo in a gentle way. Only wet the pins and never brush base! Rinse the brush pins with clean water and allow to dry, with the pins facing down. Never leave a brush to dry near a radiator or heater or even directly in the sun! Normal room temperature is ideal. Proper handling of all brushes prolongs their life.